Casa do Alambique enjoys a beautiful quiet location on the estate. It's one of three semi-detached holiday homes on the quinta and suitable for for up to 4 people. You'll enter the house through the enclosed terrace, a great spot to eat outside and enjoy the sun. The living room is spacious and bright. From the kitchen behind the living room you have a beautiful view over the vineyards and olive tree groves. There are two bedrooms, each with an en-suite bathroom. One bedroom has a double bed and the other two single beds. Casa do Alambique (distillery) gets its name from the fact that this is the place where long ago the aguardente (the Portuguese eau-de-vie) was made. For your daily groceries and restaurants you can go to towns like Torre de Moncorvo (10 minutes) and Vila Flor, "the capital of olive oil". In Pocinho ( 20 minutes) you can get on the train and enjoy a breathtaking trip through the Douro valley. Hikers can enjoy the nearby 25,000 hectare nature reserve Vale do Yua or the little further away nature reserve of Douro Internacional (you can find hiking trails online). For a day of culture: visit the city of Vila Real with its famous palace and the gardens of Casa de Mateus (from the rosé). 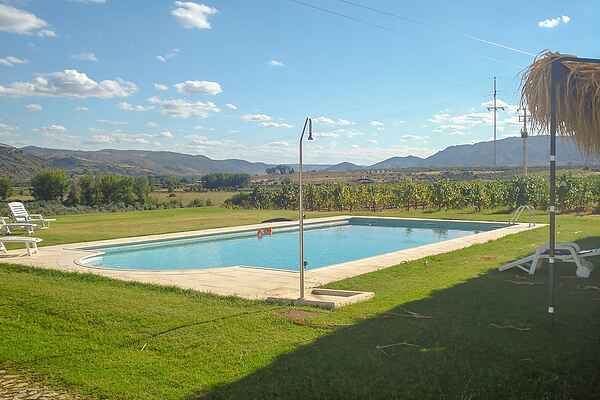 The Quinta also is a perfect base to discover this varied, still undiscovered area of Trás-os-Montes; you could try a castle route or visit the Park of Vale de Côa with its prehistoric cave paintings.